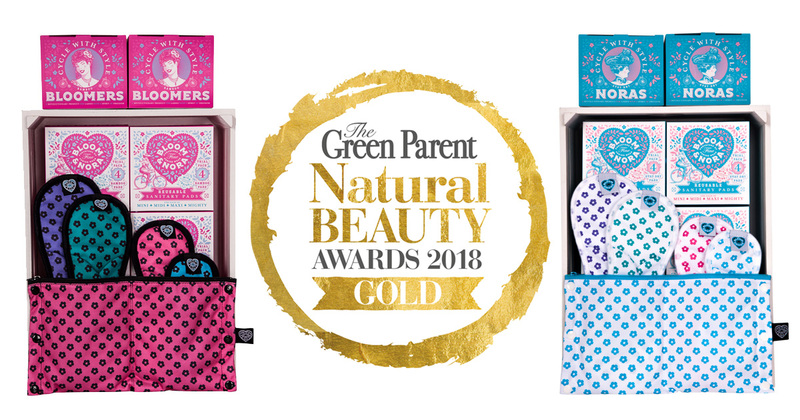 We’re delighted to announce our reusable sanitary pads have just won their first Gold award in ‘The Green Parent’ Natural Beauty Awards 2018 for Best Menstrual Care product in the body & bath category. Here’s what the judges had to say: “These pads are very appealing and come in several different colours and sizes. They are also incredibly soft, with the top layer being natural bamboo and also very easy to use. I would definitely consider buying more of these.” Bella Cohen. The Green Parent Natural Beauty awards showcase the very best in hair, skincare, products and more, and it is a true accolade to win best in category. The magazine started fifteen years ago in a tiny cottage on the Cornish coastline and has grown to become the most respected eco parenting magazine in the UK. With it’s continued focus on a low impact and sustainable family living; it gives its readers the very latest tips, advice and ideas to help them along their way. Soft on your skin, our pads are toxin free, clever fabric technology stopping pesky leaks and they are easy to wash too, and of course, the gorgeous prints brighten up your period…now you don’t get that with a single use pad! For more on our award winning reusable sanitary pads and to have a positively greener period, click here: Bloom & Nora. Win a £50 Frugi Voucher!